How Can Tunisia Stop Tax Evasion? On June 22, the World Bank reported that Tunisia is losing at least US$1.2 billion due to tax evasion by enterprises belonging to well-connected elites. The report comes after the Tunisian government conducted a number of policy reviews to improve the tax collection system and stop further fraud. The World Bank’s Development Policy Review explains that Tunisia’s tax collection system is fraught with complexity and under reports exports and imports. Furthermore, the system fails to capture revenue from the massive informal businesses sector, which has grown larger in recent years. Currently, tax revenues contribute to 20 percent of GDP and 80 percent of corporate taxation is made by only 1 percent of firms. This means that many corporations receive some form of political treatment or simply manage to operate outside of tax collection regulations. 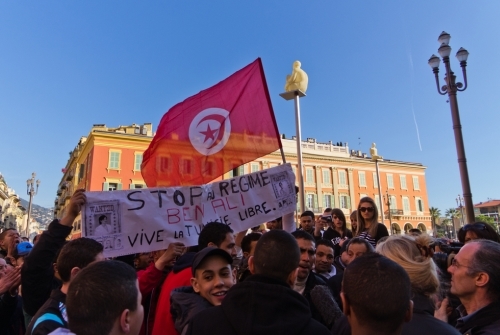 Tunisians protest elite capture of the government during the Arab Spring. Photo courtesy of the World Bank. This update on tax fraud comes at a time when Tunisia, once the region’s most thriving economy, is grappling with slow economic growth, rising unemployment, and frequent interruptions in overseas export markets. This includes Libya, Tunisia’s second economic partner after the European Union. Libya committed to supplying 25 percent of Tunisia’s fuel needs at a subsidized price, but cannot honor this agreement now. Additionally, a spate of recent terrorist attacks against tourists will serve as a blow to Tunisia’s tourism sector, which accounted for 15.2 percent of GDP in 2014. With the exception of a short-lived surge in 2012 following the revolution of 2011, economic progress has been slow in recent years. GDP growth remained at 2.2 percent in 2014 while the unemployment rate was 13.5 percent, with higher unemployment rates among females and recent graduates. This is despite the fact that the World Bank has spent $1.25 billion in Tunisia since the revolution in 2011 in the form of Development Policy Loans (DPLs), technical programs aimed at assisting Tunisian government on key issues, including budget reform. Other agencies, including the African Development Bank, the French Development Agency and the EU spent an additional $800 million to strengthen both the public and private sectors. Tunisia has taken a number of positive steps to address the shortfalls of its tax system. So far, these steps include obtaining membership in the Global Forum on Transparency and Exchange of Information for Tax Purposes in 2012; ratifying of a Multilateral Convention on Mutual Administrative Assistance in Tax Matters to allow the exchange of information for transparency and tax purposes among convention members; and securing parliamentary approval for the Supplementary Finance Law in 2014, which adjusts tax discrepancies and imposes sterner punishments for fraud and tax evasion. Despite these positive steps, there are a number of issues that still must be addressed. First, the World Bank’s report confirms that the core problem is not the tax system as a whole, but rather a handful of firms connected to powerful elites that perpetrate massive tax evasion. Diversifying the economy, enforcing the rule of law, and promoting greater public accountability would be positive steps toward resolving this challenge. Tunisia’s informal economy, which according to some sources accounts for 30 to 40 percent of GDP, not only encourages tax evasion, but also poses a serious challenge to government’s authority: It undermines the government-citizen relationship, which Tunisia needs to build given the volatile economic and political environment in its neighboring countries. Finally, the Tunisian government should analyze the major reasons for tax evasion. These include poor public service provision to citizens and a lack of support to private entrepreneurs without political leverage in the system. Given the high unemployment rate and unbalanced distribution of wealth, these are the primary factors leading to tax evasion in Tunisia. Ali Reza Sarwar is an intern with the Project on U.S. Leadership in Development at CSIS.